What fun, when we’re free to experiment with different textures and create our own style adding, highlighting, and sharpening an image until we feel it’s perfect. 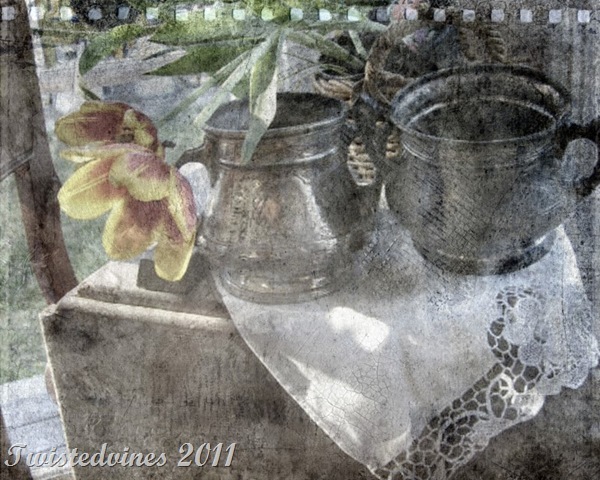 This week stopping by Kim Klassens Cafe we’re free and easy to show off our photo’s. 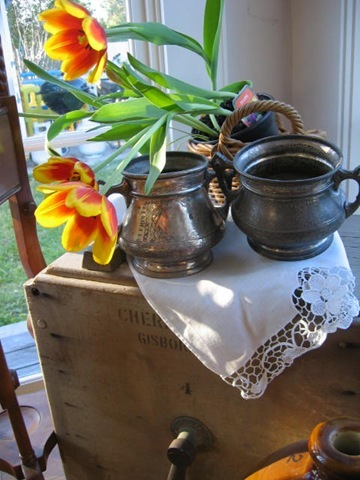 My photo this week was taken of old vintage things, antique silver…with a colourful exquisite tulip. Thanks for calling by and catch up with some wonderful photographers and their inspirational techniques by calling by Kim Klassen’s Cafe. beautiful work, love the color and the texture, inspiring, I will have to find time to create one of my own with the new textures. I love the finished product! It looks like a painting and very antique. How lovely, Yvette. Your regular photograph looks like it could be in Better Homes and Garden magazine, but your altered photo looks like it could be on the cover of a book. Your photos are always lovely and mysterious. This is stunning – so original and clever!